This recipe for yeast dough has been my go-to for years now. I started using its original form when my (now) husband and I moved to Saarbrücken to go to university. He suddenly found himself quite far away from his usual purveyor of Kokosh (an Israeli cake similar to babka), so I decided to step in. In the beginning, I used a typical non-vegan recipe for the dough, but it has now evolved into a fully vegan, local and zero waste recipe. I use this recipe as a base whenever I need a sweet yeast dough: for kokosh, babka, Schneckennudeln, raisin buns or large trays of apple or plum cake. I very often bring yeasted cakes to events, people constantly ask me for the recipe and are always surprised when they learn that it’s vegan. The advantages of the recipe is that you only need your kitchen scales, a bowl and a spoon. There’s no need to melt butter or margarine in a pot and no need for any other kitchen gadgets. 1. In a big bowl, dissolve the fresh yeast in 250g of lukewarm water (if you use dry yeast, mix in the dry yeast1)International readers, please be aware that there seems to be a difference between what Germans know as dry yeast and what is known in the US as active yeast. If you use active yeast, use as instructed on the package or in your bulk store. together with the flour). Then add 2 tbsp of soy flour and whisk until it is incorporated. The soy flour substitutes the eggs in this recipe. Add 65g of neutral oil and then stir in 80g of sugar. You can use less if your filling or topping is very sweet. Then add the flour and stir it with a spoon until the dough comes together and you can start kneading it. 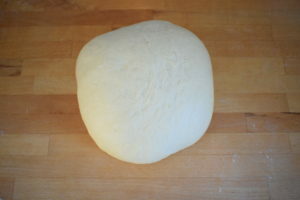 Knead it a bit in the bowl first and then on a surface until it becomes elastic and has a very silky feel to it. No need to add any flour during the kneading, the dough will stop sticking once you’ve kneaded enough. 2. Put the dough into a bowl, cover with a cotton tea towel and let it proof until it has doubled in volume. 3. Use as you would normally use your yeasted dough. 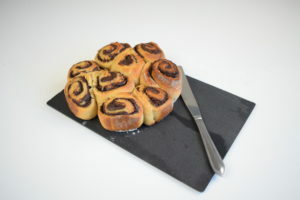 Here’s an example of a type of Schneckennudeln with a cocoa, sugar and margarine filling. 1. ↑ International readers, please be aware that there seems to be a difference between what Germans know as dry yeast and what is known in the US as active yeast. If you use active yeast, use as instructed on the package or in your bulk store.